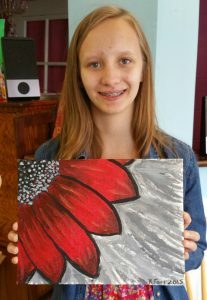 Teens & Tweens Painting Parties, in your home or I can suggest venues. 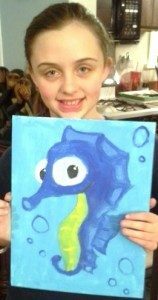 They will paint on the larger Adult size canvas that is 11 x 14 inches. We charge $22 each with a minimum of 5 girls. The painting instruction could take between 1 and 2 hours. There are both child and adult paintings to choose from depending on their maturity. 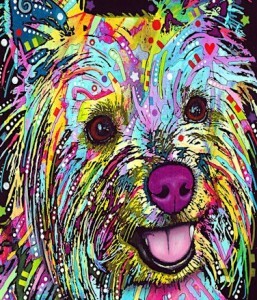 We have brochures of those paintings available. We supply canvases, paint, table covers, aprons, brushes and easels. Everything needed to complete the project and take it home that day. Please see below as far as times and a $25 deposit. Children’s parties are on Saturday or Sunday at 12 noon or 3pm. Some evening hours on Saturday may also be available. Most Friday evenings are booked with corporate accounts but you can check the calendar for availability. A lot of Pizza places with seating will allow parties also, but you must call them first for permission. Please tell them we are very careful with paint and it is minimal mess, and we clean up the entire paint area. I use photos from parties, but never use children’s names, if you see a photo that you want taken off the site, please email Peggy@smilingshamrock.com.